Considering the Radar’s spirit this might just be the new bike you know you need. These hot summer days are an exciting time for us at the bike shop, people are out of doors riding and walking by our narrow storefront from the time we open to the time we close. We have fun chatting with fellow cyclists about their planned bicycle adventures for the months ahead. And these discussions inevitably lead to opinions of what the perfect bicycle encompasses. Sometimes these discussions even lead to someone wanting us build a custom bicycle to fulfill a long held dream. 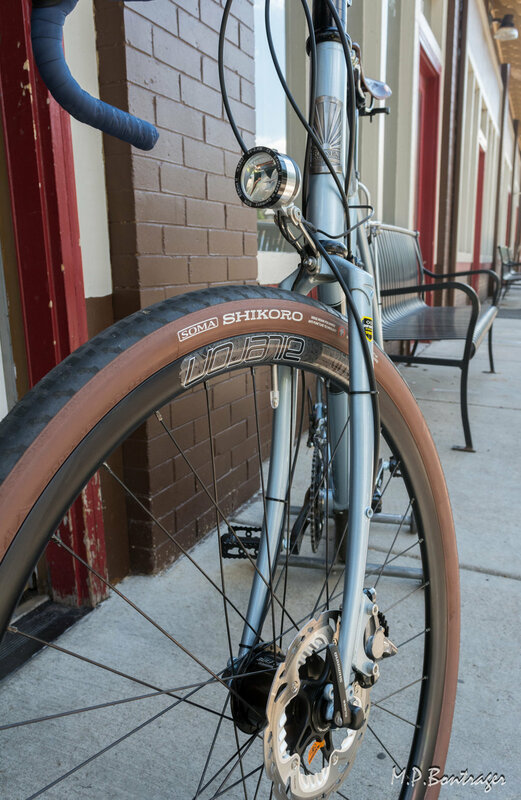 We build bicycles utilizing steel frame sets since Steel is long lasting, stylish, and offers a comfortable ride. We have completed a wide range of custom builds over the last 10 years but the common denominator has been building a bike that will suit different types of riding conditions. We have built touring bikes, cyclocross bikes, all rigid mountain bikes, road bikes for fitness rides, adventure bikes, gravel bikes and many city transportation machines. Last year we struck up a conversation with a neighbor about his commute to work. It became obvious that he had grown weary of riding his single speed up and down our Highland hills to work every day. With so many bike choices available ranging from light weight race machines to super slack frames geared for touring together we chose Soma Fabrications’s Double Cross Disc (CX). This frame set seemed to be right in the middle of these extremes, a lively frame that accelerates quickly. Here is a photo montage of his Double Cross. Ever ready for what the road ahead may offer, it’s been a reliable machine for a year now. A few weeks ago my brother, our friend Chris, and I had an unavoidable eight-hour layover at the Frankfurt airport while traveling to our vacation destination. Typically I don’t get excited about such layovers I simply utilize the time to nap before the next leg of the journey but Chris was adamant that we all trug into Frankfurt’s town center for a look and with furthor encouragement from our Lufthansa agent we agreed to accompany her. After tucking our bags into the airport’s luggage-hold center and figuring out which of a dozen trains to catch from the terminal we were off to town for the day. It’s been over six years since I’ve traveled through Germany and was immediately reminded of the cycling culture that I had enjoyed on those visits. Even on a grey drizzly February morning the Frankfurters were out and about on their bicycles! Everyone is totally calm and paying attention to traffic, neither pedestrians nor car drivers exhibit anger or impatience with cyclists. I haven’t ridden a lot in German metropolitan centers like Frankfurt but have completed two bicycle tours through the German countryside with my husband. On those trips we primarily rode on bicycle paths. The government designed an all-national, intricate bicycle path system that leads cyclists along scenic countryside routes and seamlessly through the small cities and towns in-between. The few times we chose to ride on tarmac the motorized vehicles gave us plenty of berth. It was so refreshing to be in a bicycle centric culture if only for a day. I ask, why can’t our communities adopt some of the German bicycle infrastructure design? Alert and attentive car drivers. l will continue to ride my bicycle throughout my home city even if cyclists aren’t allowed the same rights as our Northern Europe brethren. The more of us that are on the streets the more likely are rights will be recognized. Riding a bicycle designed specifically for city riding makes the entire experience all that more enjoyable. At Queen City Cycle we sell the Breezer brand of transportation bicycles which are specifically designed in the European tradition. For as little as $450 you have a solid bicycle sporting an upright riding position that handles well in traffic and allows the rider to observe her surroundings easily. A city bicycle, like a Breezer, is the first step towards incorporating cycling to your daily, active routine. We're open Weekdays and Saturdays: 10-6, Sundays 11-4, closed on Tuesdays. Our early morning commutes commence before sunrise and our evening trips home are completed in darkness. It’s time to light up! Here is a light system we just wired for a Denverite who commutes on a Surly Straggler. Luxos U designed for dark streets or long trails. Check out Peter White Cycle's webpage for detailed comparisons of the different German lights and hubs that are available. magnetic light systems cost $70-90. Don’t let the change of season get you down, light up your bike and go for a ride. Commuting to Work, bicycling to a better you. Sometimes a semi-retired all terrain bicycle can be turned into the perfect city commuter with a few minor adjustments. For the owner of this Bridgestone mountain bike we recommended a new NITTO stem and handlebar. Look at the results. Cinelli cork tape was wrapped in the grip area, for comfort and style. 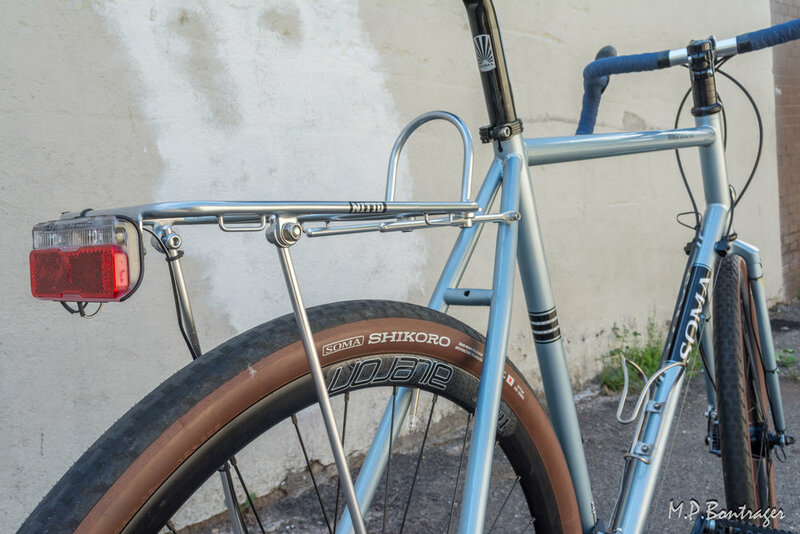 We often recommend a handlebar conversion if you have a nice quality bicycle that might be enjoyed a little bit more if the geometry was adjusted just so. As we all know, it's easier to ride with traffic if we are at ease on the saddle.